Description of "NARAD BHAKTI SUTRA"
‘Narad Bhakti Sutra’—literally meaning the fundamental formula or ‘Sutra’ that defines what comprises devotion and love for Lord God as enunciated by sage Narad who was one of the greatest devotees of the Lord and an expert exponent of this eclectic spiritual philosophy—is a treatise on ‘Bhakti’ that is succinct, precise, easy to understand, and universally respected as being one of the best spiritual guides in its genre of scriptural literature. It has only 84 Sanskrit verses, and is an excellent ‘Book of Aphorisms’ on the philosophy of love and devotion for Lord God. It can also be called a ‘Book of Spiritual Advice as taught by sage Narad’. In the spiritual realm, Bhakti (devotion and love) for Lord God is of tremendous and singular importance. There are scriptures that deal with this eclectic spiritual theme, but they are so many of them, so vastly scattered and voluminous, and so varied in their contents and different in their prescriptions that a devotee is more likely to get confused and lost in the maze of advices given by them than actually be able to benefit from reading them. The present book “Narad Bhakti Sutra” fulfils this necessity—as it presents the guidelines of Bhakti in a very precise and concise form in a language that is easy to understand. 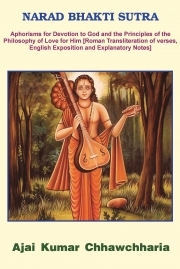 Reviews of "NARAD BHAKTI SUTRA"